This outstanding DVD automatically takes its place towards the very top rank of recordings of Beethoven’s great masterpiece. As well as top-notch musical values it also has the virtue of enshrining a very special occasion. Every year since 1951 the Dresden Staatskapelle and State Opera Chorus have performed a requiem to commemorate the destruction of the city in Allied bombing raids in February 1945. No applause is given at these solemn concerts, which end with a minute’s silence. The anniversary of the bombing, 13th and 14th February, was also the date chosen for the re-opening of the Semperoper in 1985. Hence this film of the 2010 concert marks both the 65th anniversary of the bombing and the 25th anniversary of the re-opening of the Semperoper. The conductor for the occasion, Christian Thielemann, was also marking a special occasion as he had only just been announced as the orchestra’s new principal, a post he will take up in 2012. Hence a sense of the palpably special, even the unrepeatable, hangs over the whole performance, and everyone involved raises their game to an extraordinary level. The lack of applause adds to the sacral element of the performance, something from which this great masterpiece can only benefit. The Missa Solemnis had been chosen for the occasion before by Blomstedt in 1977 and 1979, Colin Davis in 1993 and Fabio Luisi in 2005 when the work was picked for the official reopening of the Frauenkirche. Its scale and intensity is ideal for a solemn occasion like this one. At the beginning Thielemann and the soloists walk onto the stage to complete silence and at the end, after a long pause, they lead the minute’s silence. It is interesting, by the way, to see Mikhail Gorbachev in the royal box, having just been awarded the Dresden Peace Prize. The atmosphere grants a special air to the already excellent musical values. The Staatskapelle Dresden has an unparalleled heritage among European orchestras – Karajan once compared their sound to burnished gold. Their playing adds extra grandeur and beauty to Beethoven’s already extraordinary orchestration. The brass and winds, in particular, exude special authority, while the timpani are forceful without being allowed to dominate. Leader, Matthias Wollong, gives an intensely spiritual solo during the Benedictus and the explosive climaxes, such as the start of the Gloria, never become cloudy. You need only hear those majestic opening chords of the Kyrie to understand that you are in for something great. The Staatsoper chorus are also on outstanding form, razor sharp in articulation and pitching, never allowing the multiple layers of the writing to swamp or drown out individual lines. The fugue on Et vitam venturi is a model of fine choral singing. The soloists, too, are outstanding, especially the women. Krassimira Stoyanova soars with transcendent ease above the stage, blessing the whole quartet from above, while Elina Garanča is outstandingly characterful, rich and lustrous with an extraordinary grace to the bottom of her range. Michael Schade is warm and intense, while Franz-Josef Selig sings with richness and authority, though the microphone balance doesn’t flatter him, making him harder to hear when all four are singing. Their finest moment is the quartet on Et incarnatus est, where they conjure a sound of truly holy beauty. 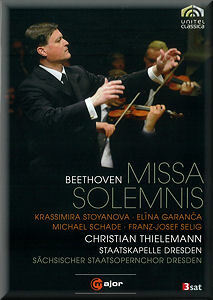 The hero of the whole performance is Thielemann himself. He has been widely recognised as the leading exponent of the great German tradition of, say, Furtwängler and Karajan, and he leads the performance with unimpeachable authority. Right from the opening chords it is clear that he is shaping the music in his own style and he is entirely in touch with the grandeur and majesty of the score and of the occasion. His is undeniably a big-boned approach, quite some distance from that of Gardiner and Herreweghe, more in the mould of Levine, but to my ears that suits this music wonderfully. He controls the big moments with assurance and allows the Sanctus and Benedictus to unfold from within themselves. Perhaps the martial outbursts at the end of the Agnus Dei lack the nth degree of passion, but this is a small complaint against a performance of such stature. The DTS sound quality is excellent and the camera direction is outstanding, pointing the eye to precisely where you would want it to be and making the viewer feel as though he is experiencing the work from the inside. There are also plenty of beautiful shots of the auditorium, as well as the individual players and singers, and it is fascinating to watch Thielemann at work at such close range. I have no qualms, then, in commending this DVD at the highest level. It will have a long and happy life on my shelf, sitting comfortably alongside recordings from Gardiner, Karajan and Levine, and more than holding its own in the comparison.